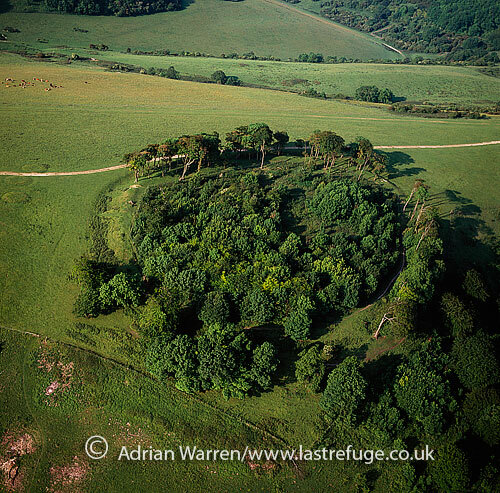 I visited Chanctonbury Ring on the South Downs on 26th July 2006 (almost 7 years to the day), as I had a great desire to see it. 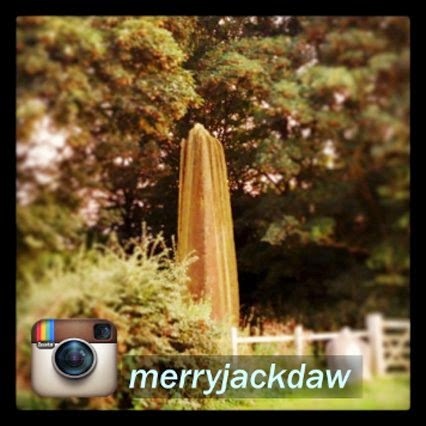 I'd dreamed about it twice before I saw it, once before I saw a picture of it, and the second dream after I'd seen an image in a Doreen Valiente book. I wrote a live journal post about it in late 2006, after my return home. I was fortunate to visit Chanctonbury Ring on the South Downs in Sussex. 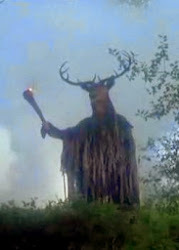 I'd heard about the Ring from an old friend, who is actually from the Brighton area, and she used to walk the Downs track all the time, and said that the witches went there. I wanted to hear more. 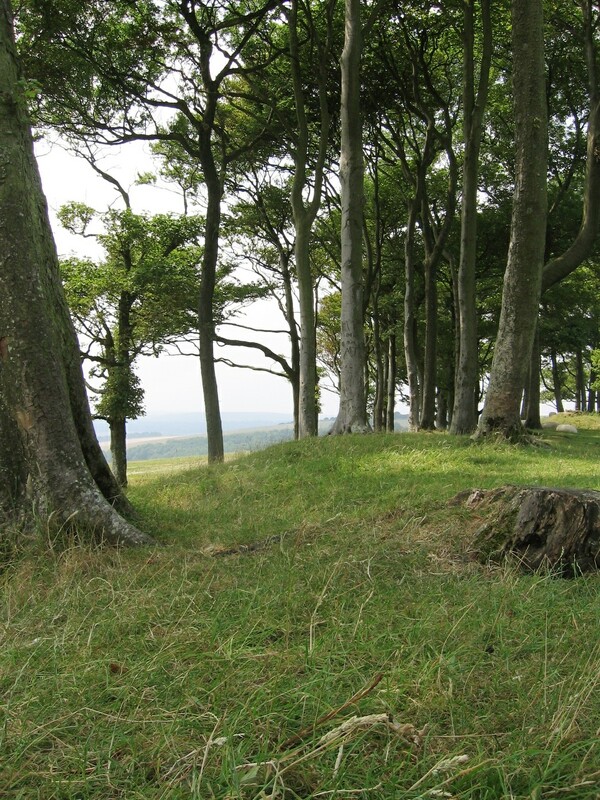 Ronald Hutton, in his Triumph of the Moon book mentions that the Iron-age rampage hillfort was covered in Beech trees. He mentioned its location - 2.5 miles S.E. of Washington village in West Sussex. I found it in my AA Great Britain Road Map. Just imagine seeing this place in its heyday. But first, before I even saw a pic of it, I had a dream about it. 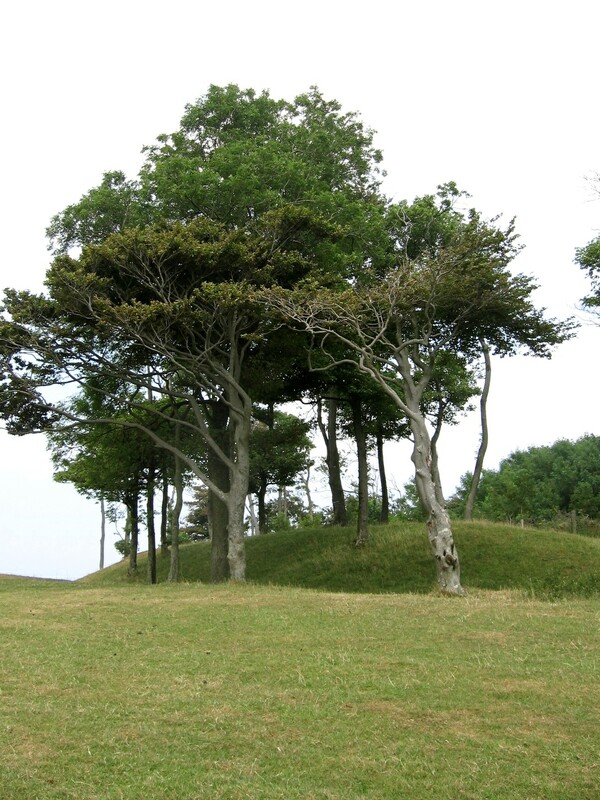 Of course, in the dream the Ring looked different, it was a tall narrow hill with a copse of pine trees on it. The afternoon sun was glowing golden, but the landscape looked like Australia - gum trees being visible here and there. I remember having a friend with me in the dream, but never saw her. 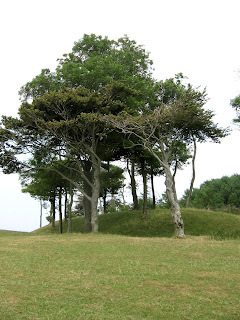 The next thing, I was on the hill and we could not see much of the outside world because of the pine trees being very thick and the peak of the hill dipped, like a small crater, and was covered in golden pine needles. 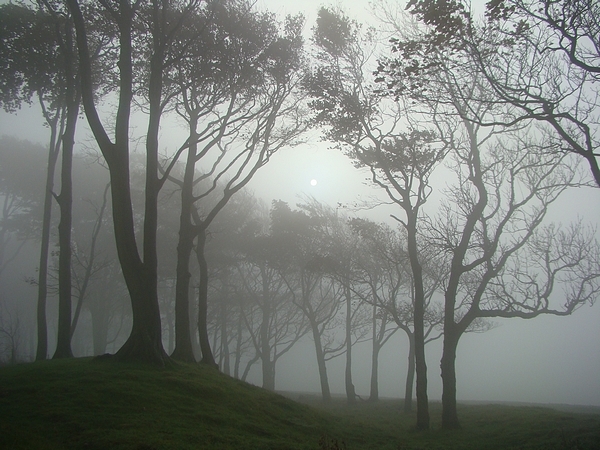 Of course this was not Chanctonbury Ring, but in my dream, I told myself it was. I really wanted to see if it looked like this. I had that dream in March 2005. Then I got a copy of Doreen Valiente's Witchcraft for Tomorrow and there was a photo of the Ring in it. It was on top of a hill, a copse of beech trees. The second dream I had about it was earlier in 2006. I could see the Ring on a distant hill, as seen in the picture in Doreen's book, and I was near a small town, but I do not recall the town I was near. Local legend has it that Chanctonbury Ring was created by the Devil and that he can be summoned by running around the clump of trees seven times anti-clockwise. When he appears he will offer you a bowl of soup in exchange for your soul. The Ring is also rumoured to increase fertility in women who sleep underneath the trees for one night. 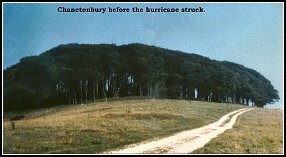 15th June 1968 the Sussex Sky Watchers began an all night vigil at Chanctonbury. Most of the night passed without incident. However in the early hours of Sunday morning one member of the group, who was walking among the trees, suddenly lost the use of his arms and legs and fell to the ground screaming for help. Other members of the group, running to his aid, were soon suffering similar affects. This lasted about five minutes after which they all recovered with no apparent after effects. Reports continued to be made of UFO's seen over the hill and ghostly images winding their way in and out of the trees though. In 1974 the Ghost and Psychic Investigation Group was formed and their main interest at that time was Chanctonbury Ring. On the 24th August 1974 four members of the group, myself included, settled down for a night under the stars. At approximately 11 pm, whilst walking through the centre of the Ring, one member of the group was lifted several feet off the ground. Mr. Lincoln remained suspended in mid air for several seconds, although at the time it seemed like hours. During this he was crying out 'No More! No More!' and was obviously in some considerable pain. 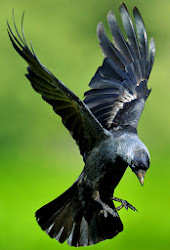 He then dropped to the ground landing heavily on his back. He was very shaken by his experience, as we all were, but unlike the rest of us Mr. Lincoln refused to visit the site for further studies. I saved this information before I went overseas, but don't recall reading it before I left. So since I went, I've learnt that the place has unpleasant feelings. I did not sense that while I was there. Many of the great beech trees are gone after the great hurricane of 1987. A lot of old, and ancient trees in Sussex and Surrey was damaged/destroyed back then. After hurricane - taken by me in July 2006 facing East. Tumuli in foreground, excavated. 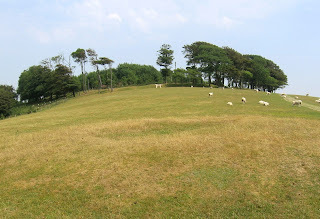 In the centre of the Ring, there is fenced off re-growth of several different plants and trees, and looks too dense to go into. 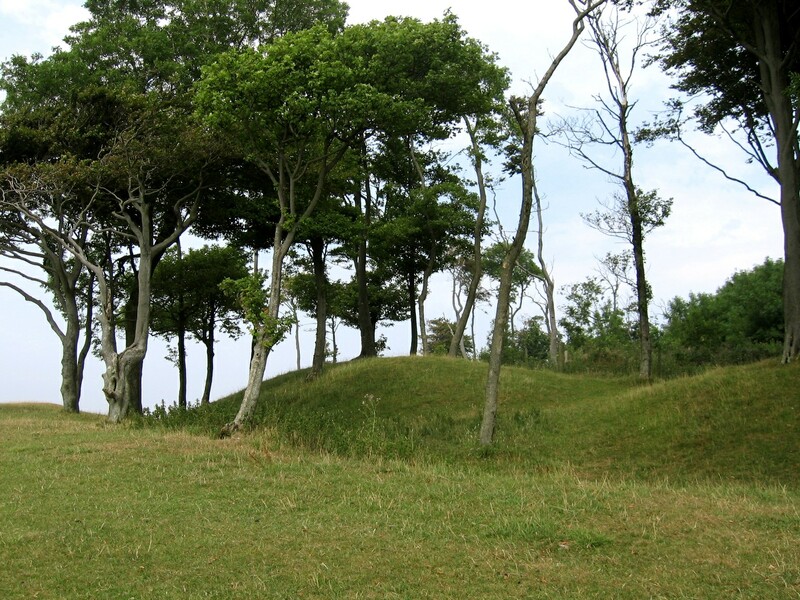 The outer ring has its distinct dykes and mounds with trees on it. Not sure if there are any burial type mounds found in the actual Ring, but I found about 5 or 6 tumulus mounds around it, all levelled with evidence of excavation, and some tumulus further down the track, some under thick vegetation, or over fences. 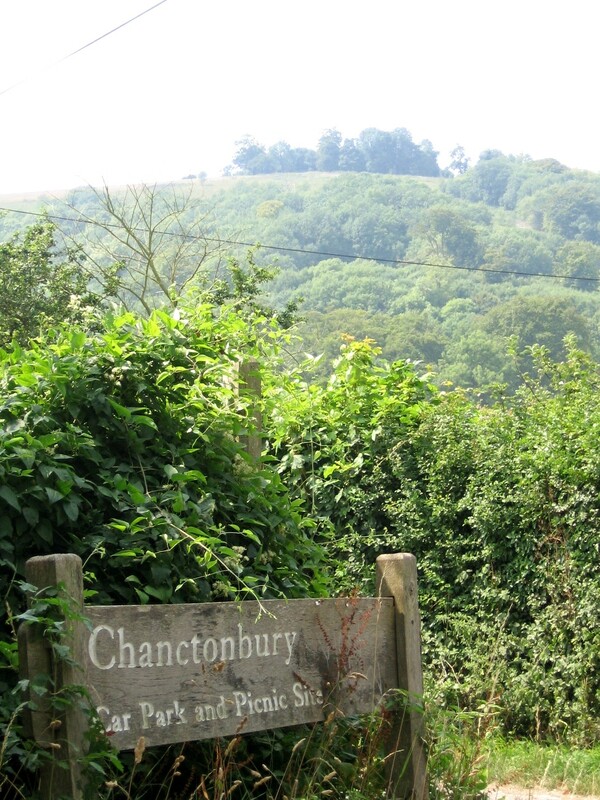 But now, my ideas of Chanctonbury are less dream-like and dramatic, as I have been there physically now, and have had no dreams about it since. The UFO sightings reported were bizarre. 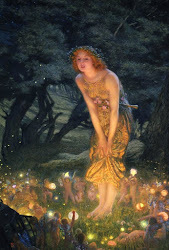 Anyone interested should read the Mysterious Britain link I added. 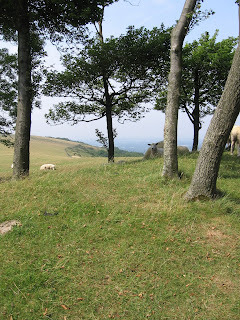 That same warm overcast day, I also went to Cissbury Ring, which is a few miles further South, on the Downs near Findon. 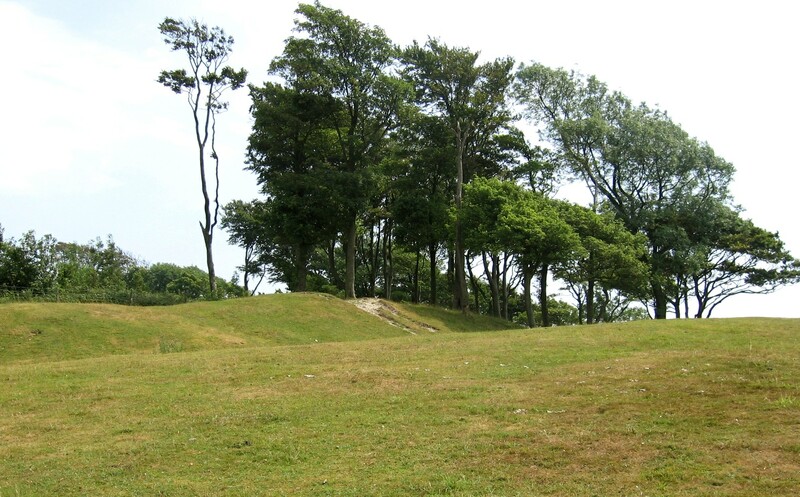 This hill fort is far larger compared to Chanctonbury, but for me, Chanctonbury has far more mystery to it. For many years there have been stories of occult activity at Chanctonbury Ring and from the early 1960's I, together with a few other interested parties, have been involved in the investigation of this site. Quite frequently we have come across small pieces of evidence, which would indicate that an occult group has used the site. 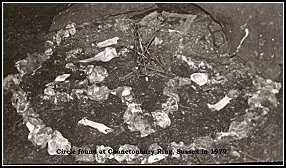 However in 1979 the discovery of a nine-foot circle constructed of flint provided positive proof. In the center of the circle was a five-pointed star, also constructed of flint, and part of a fallen tree trunk had been used as an altar. Nothing of this nature has been found since but small pieces of evidence continue to be found. 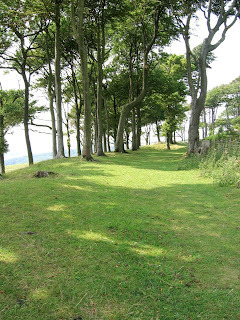 Pagans and wiccans I have spoken to all feel that Chanctonbury Ring is a 'powerful site' but most will not consider using it for any type of ritual or worship because of its bad reputation. It was thought that the damage caused by the hurricane would have made it less attractive but this does not seem to have been the case. This above piece is certainly the case - witches, according to Doreen Valiente, have been coming up here for many years. 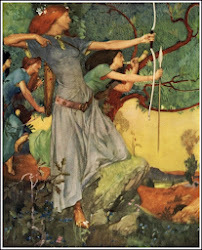 I am unaware whether Doreen herself actually went up there, but she does report in her book An ABC of Witchcraft that people are known to go up there on May Day to watch the Beltane dawn. 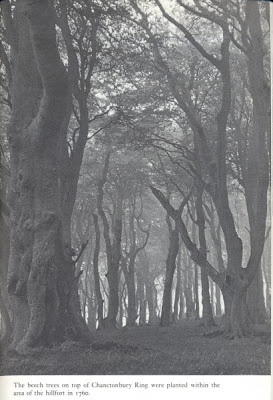 I bought a book in 2008 called The Secret Country by Janet and Colin Bord (my favourite authors) and found in it an image of Chanctonbury before the trees were destroyed in 1987. When you are there, the ring is not much to look at, and unless you jump the inner fence, you can only circle the outer ring. Nor can you get any real great photos of it unless you are in the air. Below is an image of Chanctonbury by Adrian Warren facing South. To see it on Google Earth, go to Washington - a small village in Sussex north of Findon and Worthing - it's a little bit south-east of Washington.